Calculates miles per gallon and cost per mile. Is there a better alternative to MPGCalc? Is MPGCalc really the best app in Finance category? Will MPGCalc work good on macOS 10.13.4? 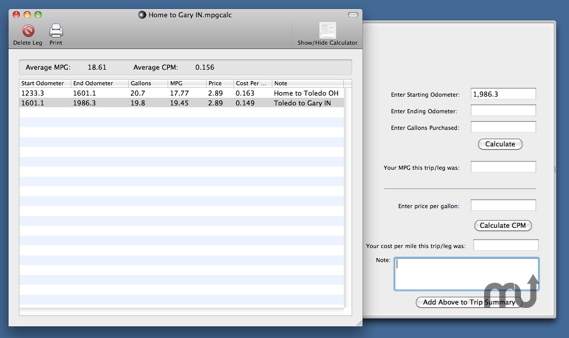 MPGCalc is a simple Cocoa application that calculates miles per gallon and cost per mile. Admittedly it does nothing more than can be done with a simple calculator, but I found it handy when tracking fuel costs in my travels. But some new features make it a bit more useful. Added an Export function, minor bug fixes. MPGCalc needs a review. Be the first to review this app and get the discussion started! MPGCalc needs a rating. Be the first to rate this app and get the discussion started!